Yes, our hotel had a 24 hour guard in place. The guards looked sort of like a Colombian jungle guerilla, dressed in black with their faces mostly covered. 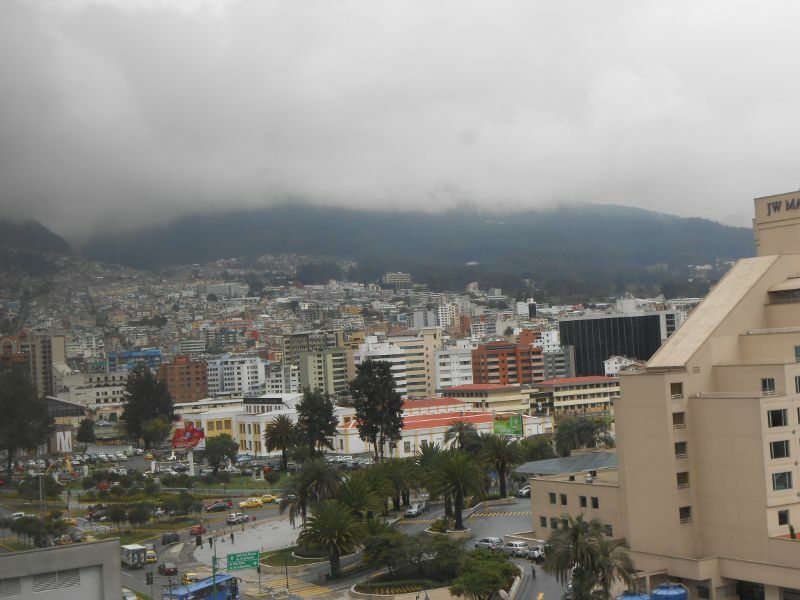 We soon learned that security guards are everywhere in Quito. Most hotels and restaurants have one. All of the banks have one of course. Some are armed with pistols, while others carry a menacing pump shotgun. Is this a dangerously criminal city? Apparently yes, although we never saw any sign of trouble during our visit. 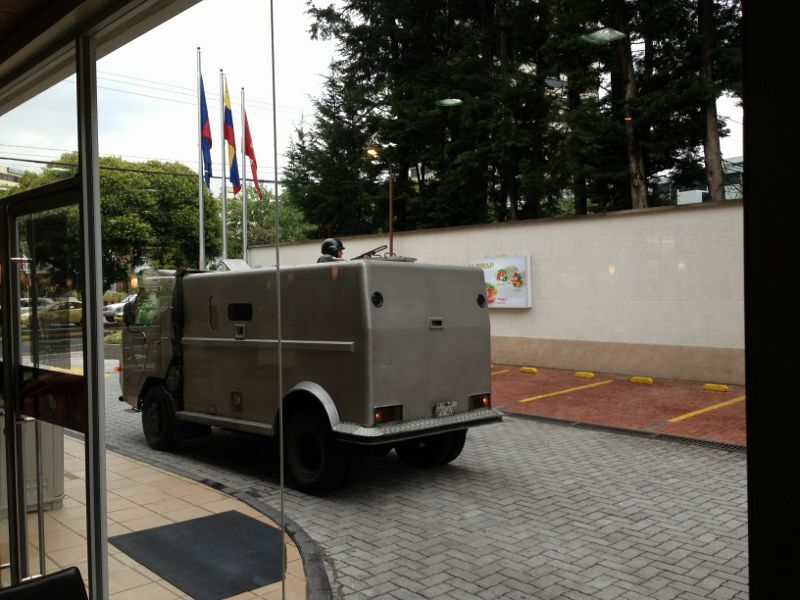 The presence of armed men everywhere soon just became an expected part of Quito for us. 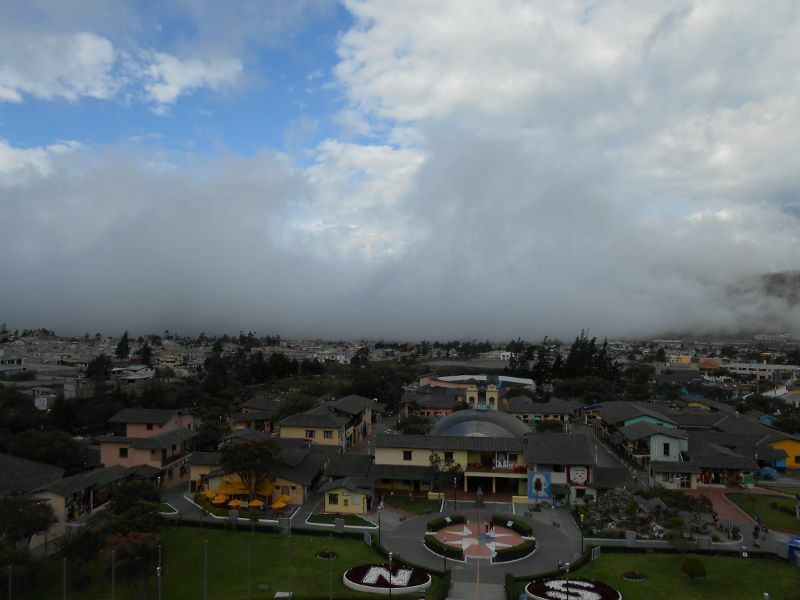 This led to one of the more surreal experiences I had in Ecuador. One morning I went out to get breakfast for us. I crossed the street from our very-American Holiday Inn to a very-American McDonald’s. When I arrived inside the restaurant, I was amazed by the scene. On the floor in the lobby was a large and growing stack of Happy Meal boxes, being delivered in handfuls from behind the counter. Next to the pyramid of boxes was a deadly serious looking security guard, holding a double barrel shotgun as if guarding the Happy Meals! He never smiled once, and looked as stern as if he were guarding the crown jewels. As I stood to the side and watched the process unfold, I wanted badly to take a photo of the sight, but I couldn’t decide whether to ask him if I could take a photo, or just try to do so without being too obvious. My delay cost me the shot, as a moment later another black-clad man emerged and the two of them left together out the side entrance. At least I got this shot of them leaving! Since the Happy Meals had not moved, they were apparently being prepared for a school trip, and had nothing at all to do with the Ronald McDonald Special Forces. I still don’t know whether this was an armored car pickup of cash, or had something to do with the military facility next door. Regardless, check out the guy sticking his head out the top of the vehicle with the mounted gun! Man, I sure wish I had that photo with the Happy Meals. But then I might not have made it back if I had taken that picture! Late in the afternoon of our first day we finally headed out into the city. 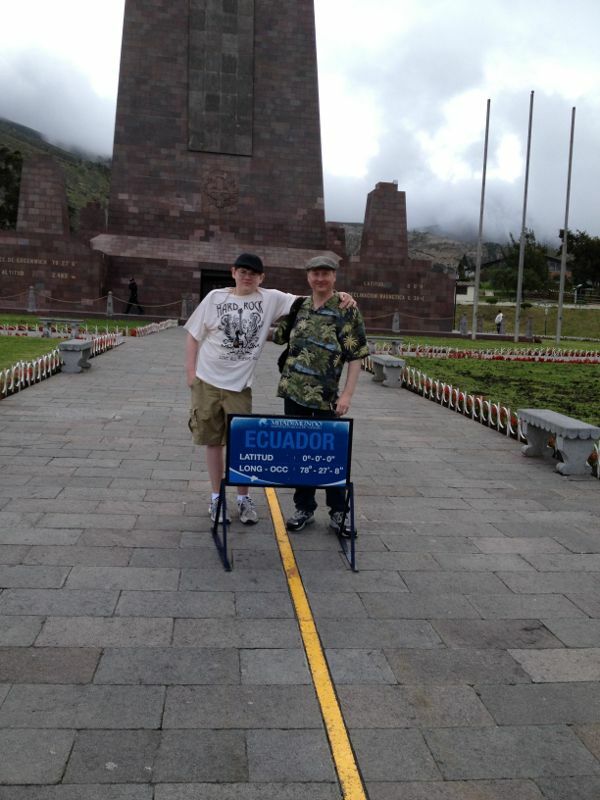 To get a feel for the place, we decided that the half-hour ride to the Mitad del Mundo monument would give us a relaxing chance to look around. 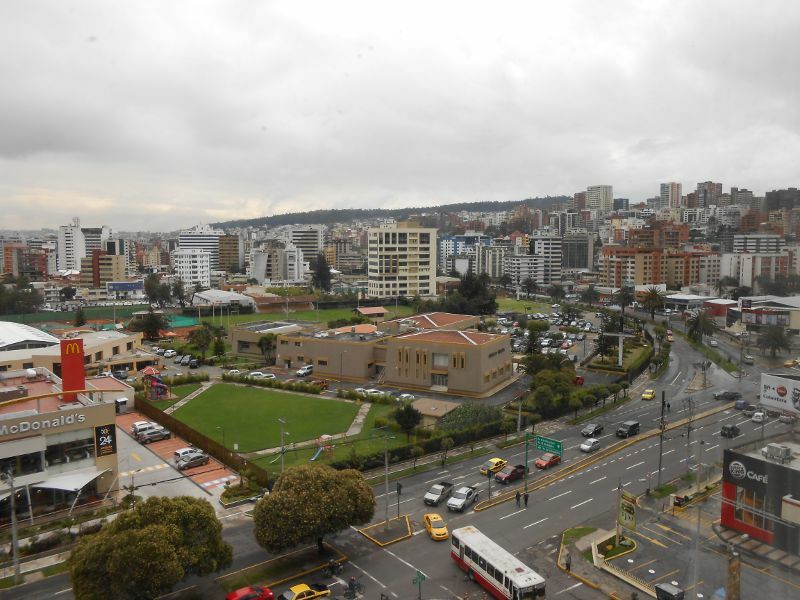 Located on the Equator slightly north of Quito, the monument site is an odd combination of museums, monuments, and tourist shops. Of course we took the obligatory picture of ourselves standing on the Equator, even though we knew that the location is not quite accurate! The weather provided a fascinating display from atop the main monument, where we had a great view of a bank of dense fog moving across the landscape seeming to gobble up everything in its path. Throughout our trip, the landscape and weather always amazed me. While I’ve never been to Montana for comparison, Ecuador and Peru would sure seem to deserve the title “Big Sky Country”. At the bottom of the photo you can see floral arrangements showing N for the northern hemisphere and S for the southern hemisphere. That’s what the guidebooks all say. They warn about the dangers of a largely unregulated fleet of taxis in Quito. Messages at travel forums will scare you to death with discussions of “express kidnappings”, where you are held hostage in a rogue taxi being driven around from one ATM to the next until your credit cards will yield no more cash. Then if you’re lucky, you are dropped off on the outskirts of the city to figure out how to get back. So, of course, here we are at the end of our first day in Quito, standing in a misty rain trying to hail a cab on the street outside the restaurant. There were several other people also hoping to get a cab where we were, and while many cabs came by, car after car was either already hired or refused to stop. Finally, after half an hour, we managed to flag down a driver and, throwing caution to the winds, we climbed in. Our uncomfortable fears weren’t helped by the very dark and very wet city whizzing by outside. Our taxi’s radio played the expected rapid-fire Spanish language commercials at full blast, but in this case they were alternating with US songs from the 1980s. That’s why our first dark and rainy Quito night will always be remembered with a soundtrack of the amusing but repetitive chorus of Blondie’s “French Kissing in the USA”.